The memoir recounts the extraordinary journey of Harriet Sandys, who travelled alone to Pakistan to see the plight of thousands of displaced Afghan refugees. In 1988, while wandering in the bazaars of Peshawar buying carpets and textiles for her store in London, Harriet Sandys heard about the death of Abdul Ghaffar Khan – a tireless crusader for an independent homeland for Pashtuns. The then Afghan government called for a four-day amnesty, putting a pause on military actions against the Mujahideen and called on its consulate in Peshawar to issue entry visas to those who wished to attend Khan’s funeral. Harriet applied immediately as was characteristic of an exploring traveller; and so began Beyond that Last Blue Mountain – My Silk Road Journeys. 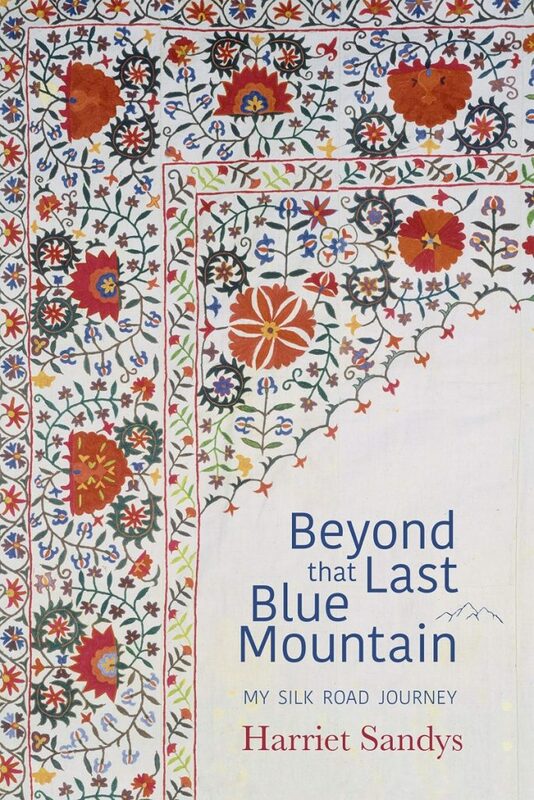 Piecing together the patchy notes she had written during her journeys and drawing larger narratives from the letters she wrote to her family, Harriet pieced together a memoir titled Beyond that Last Blue Mountain which was published by the UK-based Medina Publishing on September 4, 2018. Harriet was brought up in a country home in England’s Lake District. Her first trip eastward would come about in 1977 when Mary Burkett, her childhood art teacher, invited her to join a group that was visiting bazaars, towns and archeological sites in Afghanistan. 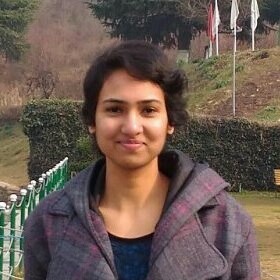 She was 23. It was this journey – described in vivid detail – that would alter the course of her life. Afghanistan had a raw landscape – arid deserts set against massive mountain ranges and colourful bazaars bustling with nomads and merchants selling kilim carpets. The place was everything she had thought it would be – certainly enough to chalk out further travels into eastern landscapes, leaving behind her parent-desired destiny to ‘do the season’ in London, find a kind man “preferably with a large estate and lots of money” and finally settle down. 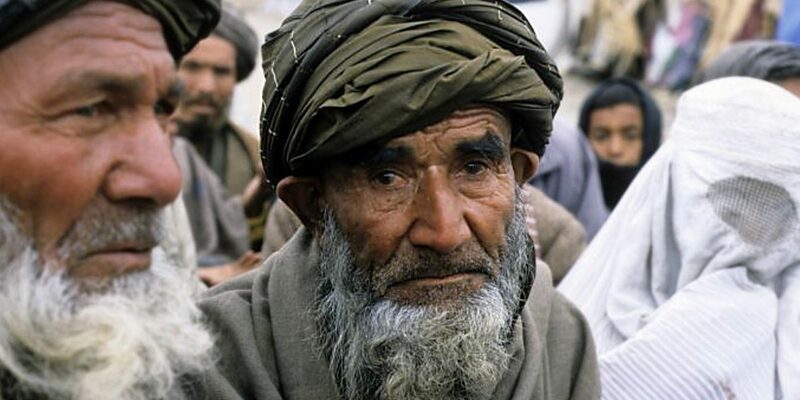 The Soviet invasion of Afghanistan in 1979 had led millions to flee the country throughout the 1980s and take refuge in Pakistan. Many such refugees were either widowed or disabled. It was around this time that Harriet was in Pakistan – where her itinerary included the Katchaguri refugee camp which was situated near the entrance to the Khyber Pass and was home to 33,000 refugees, the Afghan surgical hospital whose capacity of 40 beds was fully occupied by young men and boys who were wounded in wars and an Afghan orphanage where indoctrinations spawned the Taliban movement. She also visited the bazaars of Old City in Pakistan where she bought carpets and embroideries which she sold in London for a profit – the originate of her business, which is now called ‘Sandys Oriental Carpets‘. But money and profits aside, she was keen on helping the refugees she had just met. With the assistance of a few acquaintances, she learnt the trade and started supporting Afghan refugee women by buying their embroideries and carpets and selling them at small exhibitions organised in her home in London. Apart from such work, she would also find herself lugging salwaar kameez, Afghan chapans and rope panniers through the streets of Peshawar as wardrobe and prop requirements for the then upcoming Bond movie The Living Daylights. But all of this was happening in the backdrop of a looming call to war – a war which would claims millions of lives, including those of a few journalists and photographs who Harriet had met along the way, and displace a million others. So, while it may be easy to get engulfed in the seemingly adventurous details of Harriet’s line of work, what deserves attention is the fact that the danger was real and it takes courage, a strong sense of perception and a bit of luck for such stories to end on a happy note – more so for a lone British women traversing eastern landscapes in the time of multiple armed conflicts. In 1991, Harriet was in Kabul, Afghanistan in search of ikat silk weavers with whose help she could set up an ikat-weaving training programme. Ikat was an intricate form of resist-dyeing of yarn. This was a time when certain districts and cities in Afghanistan had fallen under the control of the Mujahideen and on occasions, they would launch about 40 rockets into Kabul in a single day. It was a time when almost every man of fighting age could be seen walking in the streets of Kabul with a Kalashnikov rifle and buildings on blocks right next to where Harriet would be would suffer direct hits. But despite the danger, or at times because of it, Harriet would undergo withdrawal symptoms on the occasions when she had to be back in London with its “grey skies, grey pavements and grey people” set against the memory of colour, noise and war that life in Pakistan and Afghanistan entailed. The hospitality which she received in the homes of locals she stayed or shared meals with would also leave her overwhelmed – a warmth she missed in the west. Soon, she would also travel to Bosnia-Herzegovina on aid-delivery missions which aimed to help the region’s Slavic Muslim community that was the victim of ethic cleansing, caught between Serbia and Croatia. And then came a trip to Syria, which was then under the rule of president Hafez al-Assad, the current President’s father. In all, the line of work she chose required her to frequently travel to places which had already or would eventually fall into the hands of the Taliban, the Al-Qaeda, the Mujahideen or ISIS. Her narrations of Pakistan and Afghanistan’s colourful bazaars and city streets bustling with central asian goods and the warm welcome of the nomads and tribesmen or Syria’s architectural richness alone merit a thorough reminiscent read. Her stories add a personal spark because they’re from the perspective of a women who led a privileged life in the UK but chose to travel, at times alone, into conflict-ridden war zones in search of adventure and a sense of purpose.